Still images of the full sky are obtained with a small camera mounted under a dome in the Atmospheric Laboratory, and provide a view with similar sensitivity to the naked eye for the study of Antarctic clouds. There are some artefacts in the images due to defective pixels (bright stationary star-like features at night), and refraction and scattering of light by the dome. The date/time on the image and movies shows local Davis time. If you have any questions about the webcams, please see our webcam FAQ. Davis research station is one of Australia's three permanent research stations in Antarctica, located on the Ingrid Christensen Coast of Princess Elizabeth Land. 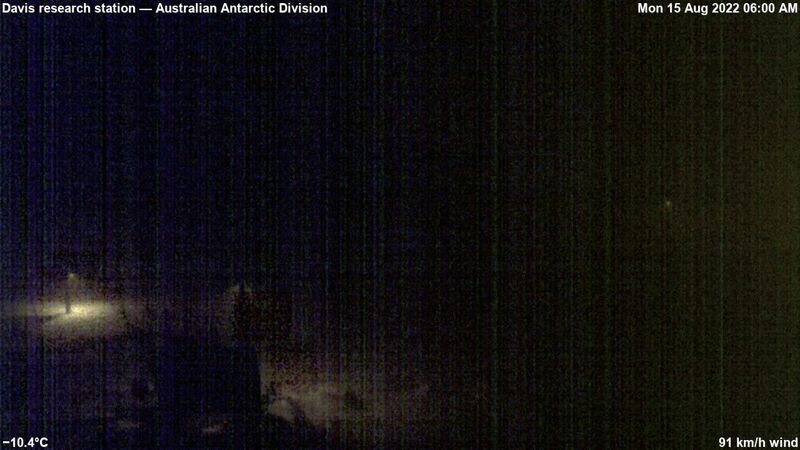 Chronological listing of videos produced by and for the Australian Antarctic Division about science and events relating to the Antarctic region. This page was last updated on 17 February 2015.